As 1917 began, a situation of deadlock continued on The Western Front with Germany still in possession of almost the whole of Belgium and large parts of Northern France. A conference between the British and French in November 1916 had already agreed to launch a joint offensive in the Spring of 1917. It was not the offensive which Haig, the commander of The BEF, would have chosen, but, like The Somme, it was largely determined by a desire to act jointly with the French. The French were to launch the major attack South of the River Somme, in an area known as The Chemin Des Dames, in the hope of breaking the German defences. The British were to launch an attack on a 14 mile front just to the North of Arras, in an attempt to divert German forces. Many new features were to be employed during the British attack, many of which had been learned during the fighting on The Somme. 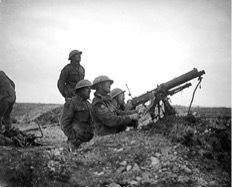 The British planned to bombard the German lines with a concentration of artillery greater than anything used previously. The artillery was to cut German wire with high explosive, but it was also to destroy German artillery batteries in order to protect British infantry. Attacking troops were to advance behind a “creeping barrage” and a barrage of machine gun fire would also be placed down behind the German lines. Another novel feature of the attack was to use an extensive network of underground tunnels to shelter men prior to the assault. The initial British attacks were a major success. The sheer weight of the artillery bombardment and German unpreparedness meant that when the British infantry attacked in rain, sleet and snow on 9 April, they swept over the German positions. The most striking success was the Canadian capture of Vimy Ridge. During the first 3 days, the British captured 11,000 German prisoners, inflicted heavy casualties and advanced over 5 miles. However, the initial success of the opening day was not continued. The Germans recovered quickly and began to bring forward reserve troops to halt the British advance. The momentum of the British advance came to a halt and no further ground of significance was gained. Some of the fighting which took place during April and May at places such as Roeux and Bullecourt, was the most bitter and the bloodiest of the war. By the middle of May attacks came to a halt, by which time British casualties had reached 150,000.